DHAKA (Reuters) - A top official at an observer group that monitored Bangladesh's election, as well as one of its foreign volunteers, have said they regret participating in the process, casting doubt on the credibility of a vote won overwhelmingly by Prime Minister Sheikh Hasina's ruling alliance. The president of the SAARC Human Rights Foundation told Reuters he now believed there should be a fresh vote after hearing accounts from voters and officials presiding over polling booths that activists from Hasina's Awami League stuffed ballot boxes the night before the poll and intimidated voters. The government has dismissed the Transparency International investigation as lacking in credibility. Hasina's political adviser H.T. 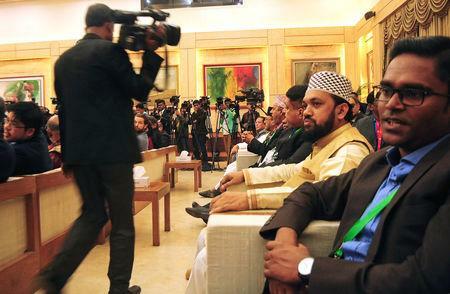 Imam called the group "a puppet" of the opposition Bangladesh Nationalist Party (BNP). Ahead of the election, the U.S. State Department had expressed disappointment that several U.S.-funded observers had been forced to cancel plans to monitor the polls as Bangladesh didn't issue visas "within the timeframe necessary". Bangladesh denied delaying visas and said it was following due process. The foundation's Secretary General Abed Ali told Reuters the group had applied for approval from SAARC and was expecting it soon. A spokesman for the Kathmandu-based SAARC, though, told Reuters it had never heard of Ali or his group. "The organization is not recognised by SAARC and does not have any relation with SAARC whatsoever," the spokesman said. The SAARC Human Rights Foundation's website says it is based in Dhaka and its initials stand for South Asian Association for Research Council. Its advisory committee includes a lawmaker from Hasina's Awami League, and a former lawmaker from the Jatiya Party, which has often been allied with the Awami League. A former minister in a previous BNP government is also listed on the panel, but no current opposition members. The secretary of Bangladesh's Election Commission, Helal Uddin Ahmed, said it had no knowledge of links between Ali's groups and any political party. Referring to the Awami League and Jatiya Party lawmakers on the group's board, Ali said: "They are just supporting our humanitarian activities." 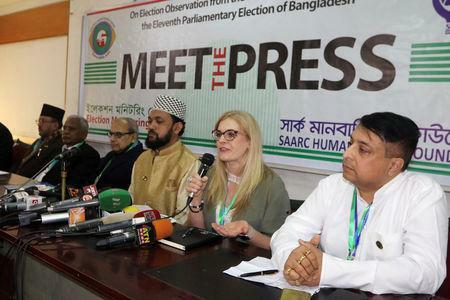 Salam, the group's president, said the observers fielded by his organisation had only monitored a few polling stations, so were in no position to make a clear assessment of the election's fairness. He said some presiding officers had told him they had been forced to stuff ballot boxes. "I want to speak the truth," he told Reuters. "I am not doing this for any political gain." Foster said she was not aware of the foundation's links to the Awami League or the lack of affiliation to SAARC. To be sure, not all the observers fielded by the foundation regret endorsing the voting. Gautam Ghosh, a Kolkata, India-based lawyer, and Hakimullah Muslim and Nazir Miya - members of Nepal's ruling Communist Party - said they stood by their initial statements that the polls were fair.